Around 4500 BC, some new people from West Asia moved into the Indus Valley and mixed with the Mehrgahr people who were already there. They brought some West Asian foods with them: lentils, and then later chickpeas. They also brought flax, to make linen clothing, and safflowers for their oil. And they brought, or they soon got, some African foods: millet and sorghum. Who were the Mehrgahr people? By 2500 BC they were using bronze, building India’s first cities and using irrigation to water their fields. This is a little later than in China, Egypt, West Asia or Peru. Maybe Indian people began to use irrigation because a gradual warming trend was making it harder to get water. 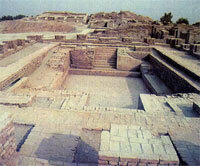 There were two main Bronze Age cities that we know of, Harappa and Mohenjo-Daro, about 400 kilometers (250 miles) away. Both cities are in modern Pakistan. The people of these cities lived in stone houses two and three stories high, and had sewage systems. The Harappans used bronze tools. They may have learned to make bronze from the Sumerians; they probably traded gold to Iran and Iraq, possibly in exchange for wool cloth. 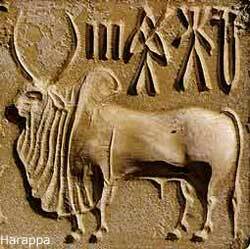 Like the Egyptians, the Harappa people used an early form of writing based on hieroglyphs. But we can’t read it, because there isn’t enough left of it for us to decode it. Although they weren’t writing, or building big stone cities, people were also living and farming in the rest of India. By about 2500 BC, farmers were growing rice in the Ganges river valley in northern India, and soon afterwards they developed new varieties of wheat and barley and lentils that could grow with India’s summer rain. The farmers used oxen to plow their fields. Some farmers specialized in one crop, and then used ox-carts and donkeys to carry their harvest to the cities and sell it to pay for their food. Other farmers, who lived further from the cities, grew most of their own food to eat. 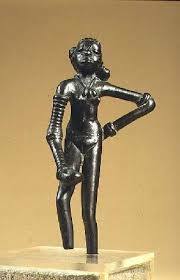 By around 2000 BC, though, the Harappan civilization had collapsed. This collapse was probably because of the same drought that caused the end of the Old Kingdom in Egypt and the Akkadian Empire in West Asia, and also started off the Indo-European migrations. This warming trend continued until there wasn’t enough water even in the Indus river valley to support these cities and the farmers who fed them. Some people probably starved to death, while others moved up into the hills, where it was cooler and some rain fell. But by 1500 BC, the Indus river valley saw an invasion of Indo-Europeans, like similar invasions in Iran, West Asia, Greece and Italy a little earlier. A Peaceful Realm : The Rise And Fall of the Indus Civilization , by Jane McIntosh (2001). All about the Harappans, but written for adults rather than kids. Cite this page: Carr, K.E. Who were the Harappans? History of India. Quatr.us Study Guides, July 20, 2017. Web. April 21, 2019. Well, we have hundreds of comments, but they are spread among more than 2500 articles, so yes, not all articles have a lot of comments. Also, we deleted all the old comments and started fresh about a year ago. Thanks for helping out, though!